cap is up to 5 cm broad, smooth and sticky, pink to reddish in color. older specimens have a planar cap with upturned edges. gills are white, graying in age, and descend onto the stem. stem is white above and below the ring with a distinct bright yellow area at the tapered base. partial veil is thin, leaving a colorless ring on the stem that soon turns black. grows alone or abundantly in areas with conifers. 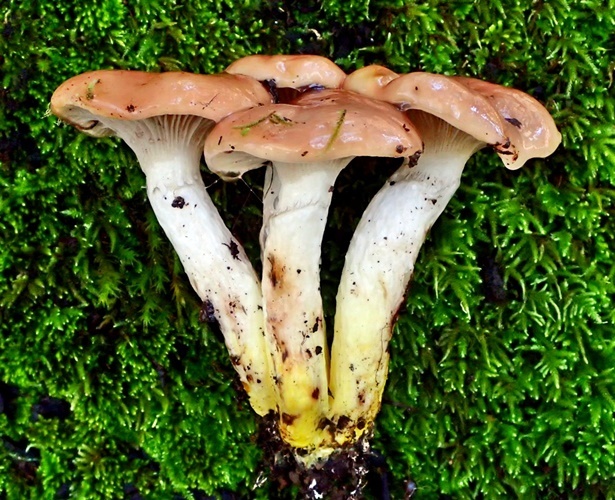 has a somewhat slimy texture and no odor; remove the cap's skin and cook before eating.